I am really flattered and humbled and equally delighted to share with you that I have been nominated in THREE categories at this year’s R.E.E.B.A Awards. I would therefore be extremely honoured if you could please vote for me. How can people Vote for me? 2) Enter your name and email, followed by name of nominee (Patricia Foster) and category. For every time a person votes for me, if they Visit the R.E.E.B.A facebook page https://www.facebook.com/reeba.gov.uk/?ref=bookmarks and write a comment saying WHY they voted for me, then they will be automatically entered in with a chance to win a FREE ticket to attend the 2016 R.E.E.B.A Awards Ceremony. The R.E.E.B.A Awards will be choosing 1 lucky Winner! 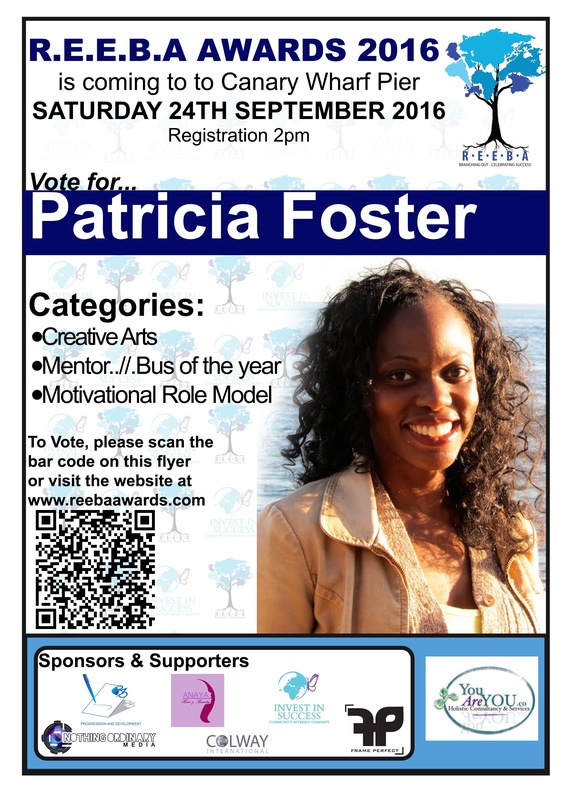 So please VOTE for Patricia Foster. Thank you so much and stay blessed! Next Video Message: Poet, Holistic Coach, Trainer, Speaker and YouAreYOU.co Founder Patricia Foster Nominated in THREE Categories at 2016 R.E.E.B.A Awards. Please vote for her! Voting ends Sunday 31st July 2016!